The Basses Loaded Series by Rod Goelz is the industry's best Bass Method for anyone wanting to learn the electric bass. That's the chant kicking around all the magazine racks, educational string periodicals and musical water coolers across the country. 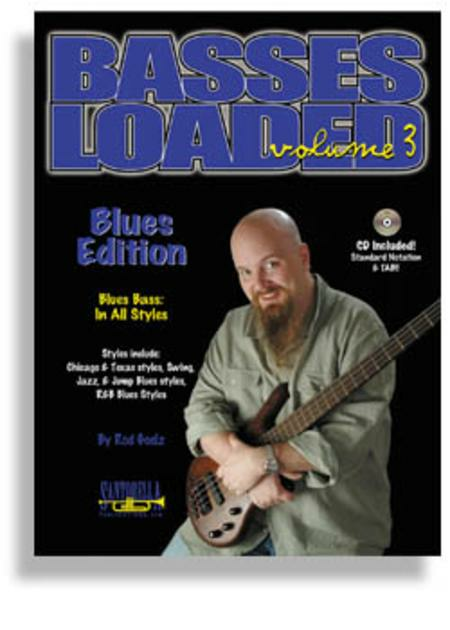 Basses Loaded: Volume 3, "Blues Edition" published by Santorella Publications covers "Blues Bass" played in numerous styles including Chicago, Texas, Swing, Jazz, R&B and Jump Blues styles. You will learn Dominant 7th Music Theory and how it's applied using Essential Blues Scales, Arpeggios and assorted Tone Sets. This Blues edition teaches the use of Blue Notes and Chromaticism in four "Shuffle" styles: Chicago-style, Texas-style, "Flat-Tire" & Jazz/Swing Shuffle. Blues bass chording & double stops are introduced with emphasis placed on assorted Blues Slur Techniques such as bends, hammer/pulls and slides, to name a few. As you learn the "5 Line Approaches" for building and improvising better "blues" bass lines, you'll be playing the styles of Willie Dixon, Paul Chambers, Ray Brown, "Duck" Dunn, Tommy Shannon, Johnny B. Gayden, Roscoe Beck, Jerry Jemmott and many others. The Basses Loaded, Volume 3 "Blues Edition" from Santorella Publications includes an instructional CD with over 35 tracks of lessons and rhythm section play-a-longs. Here's a quick glance at what you'll find inside this incredible book; Blues Bass: Basic Rhythms - Application: Chord To Chord Movement - Getting Started: A Blues Education, Dominant Theory - Three Basic Chords - 12-Bar Blues Form - The Blues: Musical Variables - Blues Theory Application: The Raw Material - Harmonic Variations - Blues Bass Profile: Willie Dixon - Blues Grooves: The "Walking" Groove - Walking Blues - Building Vocabulary: Line Approaches - MAJOR TRIAD - "BOX PATTERN" - MAJOR TRIAD APPLICATION - MAJOR 6 ARPEGGIO - THE DOMINANT 13 ARPEGGIO - MIXOLYDIAN PATTERN - PATTERN SIX: THE DOMINANT 7 - PATTERN SEVEN: THE MAJOR PENTATONIC SCALE - PATTERN EIGHT: THE CHROMATIC SCALE - The Albert Collins Jump - In The Style Of "Don't Lose Your Cool" by Albert Collins - Walking With The King Of Kings - In The Style Of "I'd Rather Drink Muddy Water" by B.B. King - Quarter Note Blues Style: Dominant Bass Line Ideas - Blues Grooves: The Jazz/Swing Groove - New Chord Changes - Jazz Discipline/Intervallic Root 5th Approach - Chromatic Approach - Ray Brown Style - Your First Jazz Experience - Freddie (Changes) - Blues Rhythm - The 8th Note Triplet - TRIPLET WARMUP RIFF - TRIPLETS: C MINOR PENTATONIC SCALE - Blues Rhythm - The Shuffle Rhythm - Blues Grooves: The "Flat Tire" Groove - In The Style Of "Everyday I Have The Blues" by B.B. King - Blues Grooves - Shuffled 8ths - In The Style Of "Blues In G" by B.B. King - Blues 'shuffle" Articulation - Albert King Style - In The Style Of "Laundromat Blues" by Albert King - In The Style Of 'stormy Monday" by T-Bone Walker - The Double Shuffle - In The Style Of "T-Bone Shuffle" by Buddy Guy - Jerry Jemmott Shuffle - In The Style Of "That Will Never Do" by Freddie King - Blues Grooves: The 12/8 Groove - Reading 12/8 Time - In The Style Of "Texas Flood" by Stevie Ray Vaughan - Blues Theory: The Use Of Blue Notes - Blue Note Etude (legato 'swing" 8th feel) - Tone Sets: "Blue Note" Tone Sets - Blues Technique - The Use Of Slurs - Double Stops: 10th Intervals - Ron Carter Style: Double Stop Blues - BLUES FOR THOSE WHO ARE ALONE - Slurred Speech Shuffle - In The Listening Room: THE SHUFFLE RHYTHM - Beyond The Shuffle: R&B Blues Styles - In The Style Of "If You Love Me Like You Say" by Albert Collins - Jerry Jemmott's Funky Bass - In The Style Of "Funky" by Freddie King - Double Stops: Guide Tone Intervals - Guide Tone Double-Stops (ala Chuck Rainey) - "Fat Albert Bass" Blues - In The Style Of "I Want You So Bad" by B.B. King - Roscoe Beck Style: Two Hand Chord Voicings - THE BETTER MOUSETRAP: "WIDE" VOICINGS - In The Listening Room: 12 BAR BLUES SONGS Note from the author, Mr. Rod Goelz The "Blues" is the single most important area of music study a bass player can work on to improve their abilities in improvisation. We'll cover many different kinds of blues from "Chicago" to "Double Shuffle" to "Flat Tire Shuffle" and "Jazz-Blues" styles, use of chording, blue notes... blah, blah, blah.... lots of stuff, trust me!